The Best Year Yet for Your Family. It is not too late for the Best year yet. It is already three months into the year and do you fill like you are still spinning your wheels? Do you fill like you are doing the same thing over and over and not making any progress? Don’t get discouraged; you are not alone. 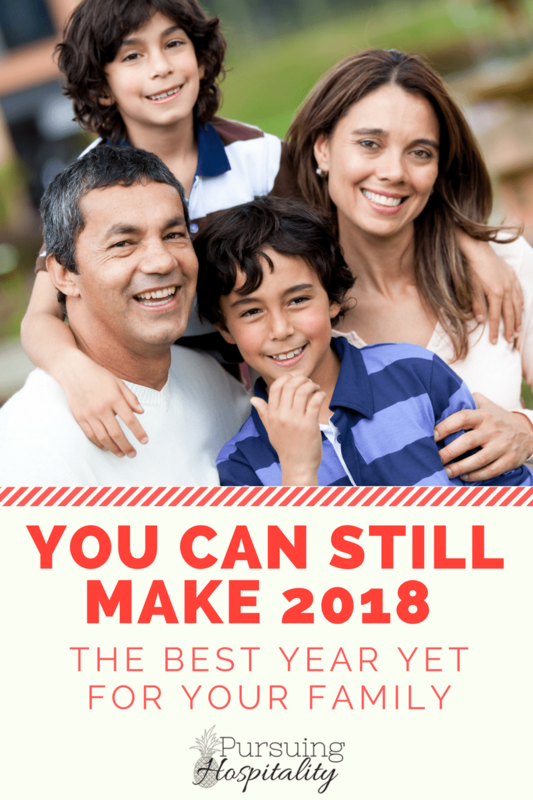 You can still make 2018 the best year yet for your family. The best year yet for your family starts right now. Each year I look back at the year we just completed, and there is always highlights and low lights. I will look at what we did that was fun, fulfilling, purposeful and also beneficial to the family and others. These are things that I try to repeat for the next year. I also look at things that were a flop. These are things that I don’t want to happen in our home. I always ask myself, how am I going to make this year the best yet for our home? Setting goals, vision and creating a plan is how you can still make 2018 the best yet for your family. Don’t spend another year just passing through this life. Make your home count on this earth. Make your home be a light in the community and also your home a place of refuge for your family and friends. What does it mean to make your home count? Making your home count is merely being on mission. You don’t want to go through this year and end up looking back and seeing that your home, or household, just stayed steady and didn’t make an impact. Making an impact in your family’s lives, your neighbor’s lives and in your community is where you should be focusing. You want to look back over 2018 and see that your family made the year count. Have a mission to complete together. What are some Missions your family can do in 2018? Every family is different and have different likes and dislikes. Find a mission that fits your family and make it your goal to complete it in 2018. Here are some suggestions for your family. Volunteer as a family once a week at your local food bank or homeless shelter. Take an evening and go together. Work together to teach a children’s Sunday School class or Wednesday evening class. Volunteer as a family to be greeters at your church with having the goal to teach your children the church family’s names. Take a few each week to pray for as well as write notes of encouragement. Hold month or quarterly gathering for your neighborhood at your home. Use this time to get to know your neighbors and learn how to love them. Visit a shut-in once a month with your family and take a meal to share with them or dessert. Offer to babysit once a month for your young couples in your community. Your family can love on the children while the parents get a much needed night out. Choose a school to support this year and make it your mission to send encouragement to the administration & teachers. If your schedule allows, adopt a family in the school to minister over the year as well. Prayer walks in your neighborhood each month together. Spend time each month prayer walking your neighborhood. Pray with your family for the families in the community. Adopt a young mom and child and mentor them as a family. Take a young mom under your wings and share life with them. Mom to mom mentoring with the family coming around as well to show community, encouragement, and acceptance. Pack necessity packets for the homeless and delivers them each month. Take time as a family to collect and gather supplies each month to pack out necessity packets for the homeless. Toothbrushes, toothpaste, tissues, hard candy, power bar, crackers, single-serve peanut butter, small bottled water are just a few suggestions for the packets. Use a quart or gallon size zip lock bag. 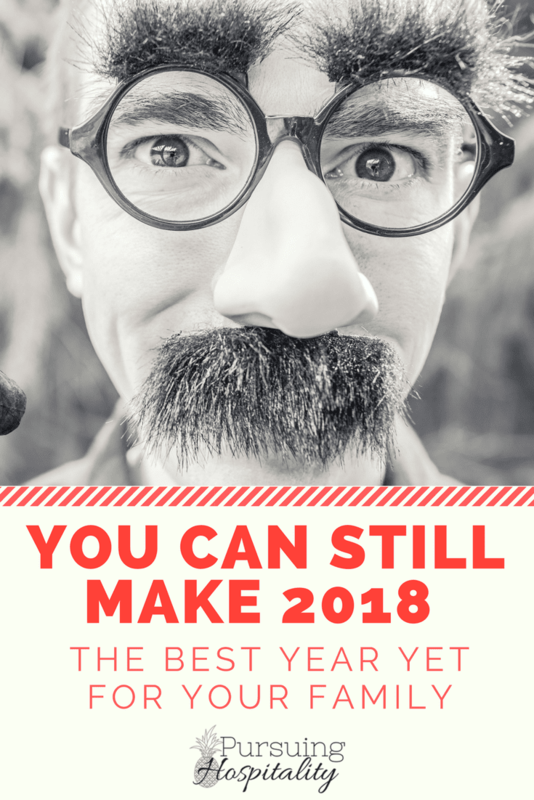 How to make it the BEST 2018! You can make 2018 the best year yet for your family just by just putting the focus on others and intentionally reaching out to your community and meeting a need. So it is not too late to implement some of these ideas. Take time to grow with your family in the area of hospitality and outreach. You will be amazed at how it will be just as much a blessing to your family as it is to the one on the receiving end.